With Jenn decked out in a few pieces from the $500 shopping spree c/o Nordstrom! A couple of Saturdays ago, I had the fun opportunity to host an event at Topshop Nordstrom, at Chandler Fashion Mall. I absolutely love the trend forward fashion line, and I am so excited that it has come the States, especially mine, Arizona! The line has this edgy yet feminine, rock star, street style vibe. Any piece you pick out, adds instant cool appeal to your wardrobe. For the event, Nordstrom decked me out head to toe in a few of their latest pieces, like this metallic jacquard skater skirt. I absolutely love the silhouette of skater skirts. It's very UK chic. Quirky sweaters are all the rage this season, and I love this mirrored zebra sweater I picked out. We added the peter pan collared top to peek out, and finished the outfit with the Millicent boot that is accented with gold studs. I had so much fun at the event, and appreciate everyone who came out! It was so great meeting you, and chatting! So big, BIG thank you!!!! During the event, there was a $500 raffle at stake, and when I drew the name, there were several disappointed girls! I wish you all could have one, but alas, there was only one girl - my friend Jennifer! We met up a couple of weeks later to shop together, and let me tell you, she got some amazing things! Jennifer is a beautiful girl, with an amazing body that can wear just about anything, which made my job easy! Her style is fairly basic, with classic silhouettes and colors. Since I knew her so well, it was easy to pick out what I thought would incorporate the trendiness of Topshop into wardrobe without deviating from her taste. You want things that you'll know how to wear in the future. I think these burgundy skinnies, and ankle boots are great additions to her wardrobe. This sweater she is wearing is really cool. The back of it is chiffon and has a lower hem. The addition of the peter pan collar necklace was the perfect accessory to add a surprising element, and pull the look together. We had so much fun shopping together and spending her $500! 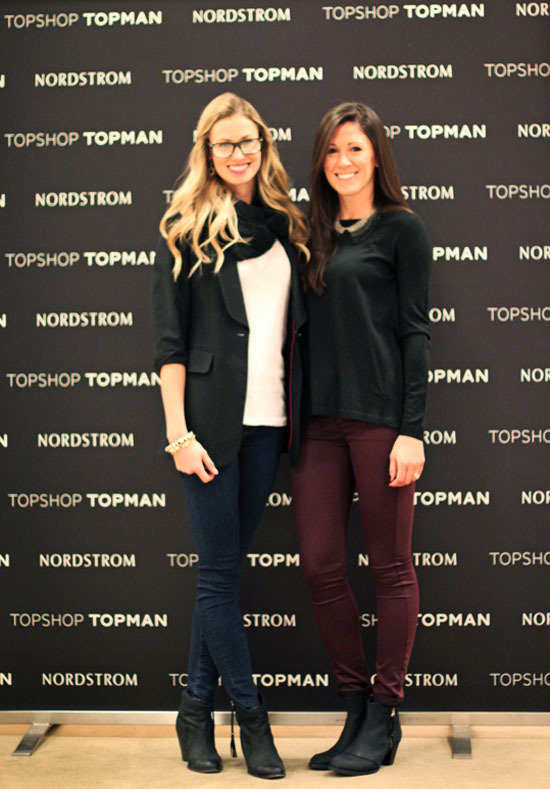 Big thanks to Nordstrom and again, all of you who came out that day! Love Topshop! Thanks to nordstrom I dont have to haul to NYC for shopping! We just got a Topshop here in Vancouver and I love it too. A little on the pricey side though, but I love their selection and styles. looks like you had such a blast Katie!! and of course loving your outfits! Looks like a great event! Kudos! Love Topshop!! I love there clothes. When I was in London this summer I found a lot of great buys. Congratz on a success day with a great company. Looks like so much fun - love both your outfits, but especially that fun metallic skirt! I love, love, love your outfit! :) I saw part of the collection the other day at a SF Nordstrom... impressed! Cute look! Loving your sweater! Such cute photos! looks like a fun event! Awe looks like such a fun time! Wish I was there! It was an awesome event! Thanks for hosting! :) and it was so great to meet you! I love Topshop-so cool it's at Nordy's!!! This looks like so much fun! That skirt on you is amazing! What a great event! You look fab and it looks like a fun evening. I love the kitty cat tee and your sparkly skirt!! SO cute. You look so cute in that skater skirt! Wish I could've been there! YEA! I made the blog!! Always a fun time with you, Katie!